We use LDA and Labelled-LDA (Labeled LDA) to investigate Fragmentation within Android's bug tracker (issue tracker). We found evidence of fragmentation and found that labelled-LDA produced topics more relevant to our intent than LDA but at one to two orders of magnitude the effort. Common Topics shared between 2 Android Vendors. The fragmentation of the Android ecosystem causes portability and compatibility issues within the entire Android platform, which increases developer workload, delays application deployment, and ultimately disappoints users. This subject is discussed in the press and in scientific publications but it has yet to be systematically examined. The Android bug reports, as submitted by Android-device users, span across operating-system versions and hardware platforms and can provide interesting evidence about the problem. 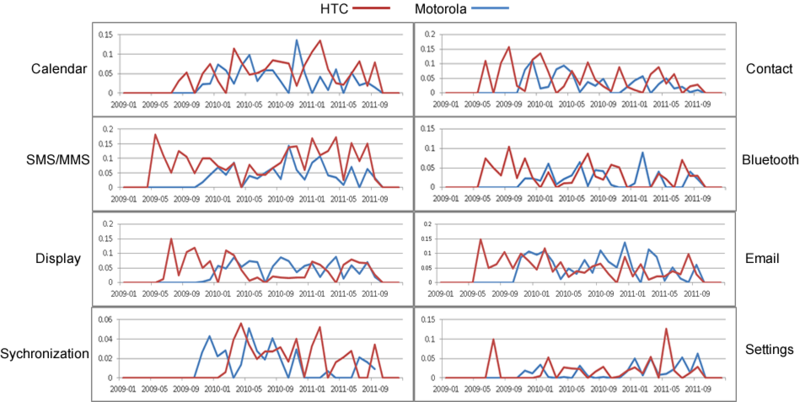 In this paper, we analyze the bug reports related to two popular vendors, HTC and Motorola. First, we manually label the bug reports. Next, we use Labeled-LDA (Latent Dirichlet Allocation) on the labeled data and LDA on the original data, to infer topics. Finally, by examining the relevance of the top 18 bug topics for each vendor’s bug reports over time, we classify topics as common or unique (vendor-specific). The latter category constitutes evidence of fragmentation and lack of portability. By comparing Labeled-LDA against LDA, we find that Labeled- LDA produced better, i.e., more feature oriented, topics than LDA. In this paper we find out how fragmentation is manifested within the Android project and we propose a method for tracking fragmentation using feature analysis on project repositories.